God named all three of the patriarchs. He changed Abram’s name to Abraham. He chose Isaac’s name and announced it to Abraham before the child was even conceived. In this week’s Torah portion, He changes Jacob’s name to Israel. As he prepared to face Esau, Jacob experienced a strange mystical encounter with God. He had sent his family, his servants and his possessions across a river ahead of him. He was about to follow when he was suddenly attacked by an assailant. Jacob wrestled the man through the night. The attacker turned out to be none other than the angel of the LORD. The angel blessed Jacob by changing his name to Israel. Later in this week’s portion, in Genesis 35, the name change is repeated. When Jacob returns to Bethel, the LORD tells him, “‘Your name is Jacob; you shall no longer be called Jacob, but Israel shall be your name.’ Thus He called him Israel” (Genesis 35:10). The name Jacob represented Jacob’s life before encountering God, his old nature. The name Israel represented Jacob’s life after encountering God. It represented his new nature and new destiny. A genuine encounter with God is life-changing. It is a sort of wrestling match. The apostles teach us that, through faith in Yeshua, we are born again as new creations. In Messiah we have a whole new identity. Paul speaks of our old identity as the “old self.” He declares that, for the believer, the “old self was crucified with [Messiah], in order that our body of sin might be done away with, so that we would no longer be slaves to sin” (Romans 6:6). “Therefore if anyone is in Messiah, he is a new creature; the old things passed away; behold, new things have come” (2 Corinthians 5:17). Our social circles are important. We become like the people we hang around with. We absorb their values and tend to imitate their behavior. In all innocence, Dinah the daughter of Jacob wanted to spend time with the teenage girls of Shechem. It was the wrong place for her. She did not belong with the Canaanite teenagers. If we want to keep our children on a moral path, we cannot place them in the midst of immoral children. No matter how godly and upright our sons and daughters are, regardless of how well we have raised them, we cannot expect them to prevail over the laws of sociology. When we allow them to socialize with a peer group that holds a different set of values, our children will inevitably adopt those values. It’s not a conscious thing. Many families have seen years of godly training vanish after sending their children to school or allowing them to interact with worldly peers. The same principle applies to all of us. Though we are to be a light to the world, we are not to be of the world. The people of God are supposed to be a different type of people altogether. In order to be different, we need to maintain strong boundaries. Being chosen by God to be a holy people isn’t fair either. It is a privilege. Please consider supporting FFOZ with a financial contribution. We are pleased to announce 3 different Restoration products, now available at the FFOZ Store (http://ffoz.com/store). 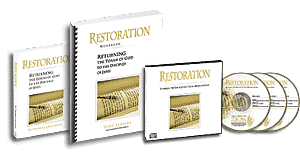 The Restoration Book, the Restoration Workbook and the Audio Book. The new workbook contains fifteen chapters that correspond to the chapters in the book Restoration, written by D. Thomas Lancaster. Each chapter contains an introduction and questions to help the reader explore the concepts and ideas presented in the book in more detail. This workbook is primarily intended for use in a group setting. Group leaders could set up a book study, where participants read a chapter during the week, and then the group could go over the workbook portion of the chapter during the study. The Restoration Audio Book, read by D. Thomas Lancaster, contains six CDs and is narrated by the Author. Torah Club. For an introduction to Torah Club click here.